Why is the UAE now pressing ahead with efforts to capture Hodeidah? The United States and Saudi Arabia are now on the same page with the Emiratis about Hodeidah. Some advances by Emirati-backed forces elsewhere in Yemen encouraged Washington to approve this operation. There’s a view that the Emiratis’ allies in Yemen could gain strategic advantages, as well as greater authority over what comes in and out of the port. The Emiratis first proposed this in February 2017, although they had previously wanted to reduce their role in the Yemen conflict. When, in 2016, they were indicating they wanted to draw down their troops in Yemen, it seemed to be about having achieved influence over parts of the south through warlords and other local leaders. Now, they seem to be interested in a more ambitious idea: to have influence over parts of the north as well as the south. They’d accomplish that through local proxies? They’ve got local allies in the south, and they seem to want to expand that Yemeni network north, with assistance from the United States, Saudi Arabia, and, to a lesser extent, Britain and France. [Prior to 1990, present-day Yemen was divided between the northern Arab Republic and the southern People’s Democratic Republic.] The Emiratis have the advantage of their own special forces on the ground advising Yemeni allies. The Saudis have some low-level, nonmilitary officials in Taiz, for example, but not any significant military presence, other than with some cross-border incursions in parts of the north. Why has the UAE gotten so deeply involved in this Saudi-led war? The de facto Emirati leader, Sheikh Mohammed bin Zayed, has partly redefined UAE nationalism as military muscle flexing and seeks regional influence and enhanced deterrence against Iran around the Arabian Peninsula. 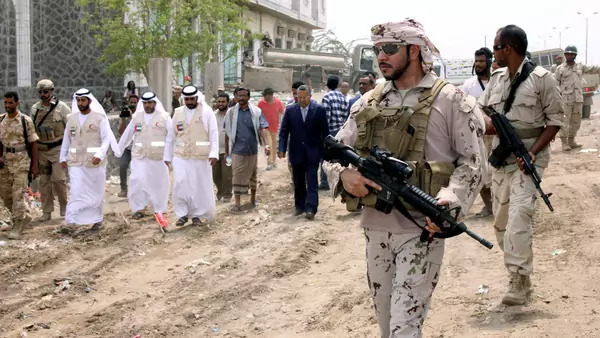 Yemen also provides a chance for the UAE to combat the Islamist militancy they define as an existential threat, even as the UAE, paradoxically, has Salafi cultural traditions itself and works with Yemeni Salafi fighters for tactical advantage. How does the Emirati approach square with Saudi objectives? Saudi Arabia doesn’t want to commit ground troops, but it’s nervous about what the Emiratis seem to be achieving by having a ground presence. They are also worried about the Emiratis’ expanding role in naval security in the Red Sea and Arabian Sea. They are nervous about the Emiratis’ military presence on Socotra, the strategic Arabian Sea island. Many Yemenis are also nervous about the Emirati presence there and elsewhere. At the moment, some Yemeni forces are going along with the Emiratis, seeing them as useful in terms of their own ambitions in parts of the south, for example, or as the only players likely to help them dislodge the Houthis, as in Hodeidah. But other Yemenis feel wholly differently and are working with the Houthis as the best chance to constrain such schemes and to fight Sunni militants or other Yemeni forces, whether rival tribes or political trends and personalities, who’ve historically not taken their concerns seriously. How large is the Emirati ground presence? I would be surprised if there were more than a thousand Emiratis on the ground, at the most. For the most part we are talking about relatively small numbers: Emirati special forces, the kind of elements they’ve deployed to Afghanistan and Kosovo in partnership with the United States, and probably some regular Emirati troops, sometimes working in coordination with special forces of other countries, such as the United States, seemingly France, and quite possibly the UK. There’s a whole range of Yemenis in the fight, often with shifting loyalties, as well as foreign mercenaries. The number of rebels opposing the Houthis seems to be in the realm of tens of thousands, but it’s hard to gauge, because we are talking a loose amalgamation of different Yemeni elements, whether it’s Republican Guard forces [loyal to ousted President] Ali Abdullah Saleh, [killed at the end of last year,] or elements that are strictly local. There’s a whole range of Yemenis in the fight, often with shifting loyalties, as well as foreign mercenaries. Are the interests of the UAE and its local proxies well aligned? They’re not, and this is the danger. For the time being, some Yemenis who want to disperse the Houthis will perhaps go with these Gulf states, but it’s not necessarily a permanent or reliable arrangement. At the moment, there is an amalgamation of southern elements in an Emirati-backed Southern Transitional Council, which brings together competing elements, including those with rival visions of a southern entity that could put them directly in conflict with each other, as some seek regional secession or authority over territory sought by others. This was a danger, for example, with the 2014 proposals for federalism or regionalism as a way out of the conflict throughout Yemen. Suggested or historic regions don’t necessarily fit with the ambitions of local actors, in the south or in the north. Will UN special envoy Martin Griffiths, who met with the Houthis in Sana’a this week, be able to move the peace process forward? The Houthis are being asked to hand the administration of Hodeidah port to the United Nations, while the Saudi-led coalition is going all-out to seize it and the surrounding territory. It seems disingenuous for the Emiratis, for example, to welcome Griffiths. He may, at a certain point in the Hodeidah fighting, be able to oversee some form of localized ceasefire, but grander ambitions, such as those contained in his wider ideas for a transitional, inclusive, government, may be far off. The outcome has to be a government in which the Houthis play a significant role. We should not be too ambitious that political structures in Yemen can be durable and can have a wholesale buy-in because, arguably, such institutions haven’t existed in modern Yemeni history. But eventually an end to the fighting throughout Yemen will require all parties to the conflict to be part of the discussion. The United States, Britain, and France are themselves a party to the conflict. Iran, at least indirectly, also needs to be a part of that discussion. The outcome has to be a government in which the Houthis play a significant role. Western diplomats need to have discussions in Riyadh and Abu Dhabi; at the moment, they are on the same page in terms of pushing the conflict in Hodeidah, but they don’t seem to have a clear strategic objective. The Houthis will not give up just because they have lost ground in Hodeidah. Is there much clarity over Iran’s role? The Iranian role [backing the Houthis] has grown since the air war was launched. That may not have been envisaged, but it’s certainly an outcome. Pinning down the extent of that role is difficult. For example, [Saudi Arabia and the UAE have] alleged that a lot of components, at least, of missiles that [the Houthis] have launched against Saudi targets have come through Hodeidah port, and yet, Hodeidah port is blockaded fairly successfully. Perhaps equally likely is that they have been smuggled through other avenues, including across the Omani border. It’s possible there has been limited Iranian advisory presence on the missile capability of the Houthis. It seems possible that there’s also been advice for Houthi fighters outside of Yemen. But there is no evidence of a major on-the-ground military role being played by the Iranians. After the Saudis’ last disastrous war in Yemen, a ground war in 2009–10, there is evidence that they engaged with the Houthis to talk about border security arrangements. The Saudis are at their weakest in those border areas. The Houthis have to be part of arrangements for Saudi national security, and that would also involve Iran in the discussion, even if their participation in talks had to be behind the scenes. But if we simply see the Houthis as a foreign agent, as Hezbollah in Lebanon is often depicted by its detractors, then we will miss the prospect for a solution in Yemen. What do you make of the Emiratis’ claim that they can prosecute this battle while averting humanitarian catastrophe? The track record of the Saudis and Emiratis has not been good in terms of avoiding civilian targets in the course of nearly three and half years of the air war. The port is already blockaded by the Saudi-led coalition, but it is a key lifeline. If fighting ensues around the port area, it seems hard to imagine that there can be humanitarian guarantees without some kind of stabilization of the situation on the ground, which might have to involve international peacekeepers or an international presence. I’m only speculating, but such an arrangement might have to form part of the guarantees that would encourage both the Houthis and their adversaries to accept a ceasefire in Hodeidah. Building something bigger than that, as the UN wants, to affect the struggle elsewhere in Yemen may be much harder and will require all parties—international, regional, and local—to accept power-sharing over what remains of the Yemeni state, even if precise structures on the ground are hard to tie down.